The Virgo Girl is the embodiment of endurance and tranquility. A little lady behaves with dignity in any situation: she does not play on it, does not misbehave, does not cry. She never argues, she carries out all her assignments with pleasure. Parents can be proud of their ideal daughter, who pedantically observes the regime of the day. Lovely, obedient girl is praised absolutely everything: relatives, acquaintances, teachers, educators. The Virgo have a unique quality — reliability. A sensible girl carefully weighs her every step, tries to plan life for decades to come. It shows seriousness and prudence from a diaper, does not like surprises and surprises. Clearly knows what she wants and most importantly — how to achieve it. Close people can be sure of the girl, she does not have such qualities as flutter, unpredictability. A practical and tidy girl is the dream of any parents. Distinguished by discipline and diligence, she likes to do household chores. It is with great pleasure putting things in order in their room, always washing the dishes behind them. Just a little girl-Virgo shows miracles of economy, she never throws old toys, herself often makes dolls for herself. Absolutely calmly tolerates loneliness, shows a rare judiciousness. Virgo is an earthly sign, whose representatives are distinguished by their perseverance and purposefulness. Silent and inconspicuous girl since the childhood makes big plans for life. With enviable persistence moves to its goal, not paying attention to obstacles and difficulties. While her contemporaries are romancing novels, carefree entertained, she persistently engaged in planning to enter the best educational institution. Chooses a profession related to money, recommended areas of activity: real estate, banking, trade. The Virgo girl from the cradle shows calmness and endurance. She does not mislead her parents with her whims and demands. Always guided by common sense, tries not to make spontaneous decisions. Parents sometimes think that their daughter is an adult-wise old man, not a small child. The baby will not start hysterics if her mother does not want to buy an expensive toy. She will take to consideration the arguments of the parent and offer the most economical option of buying. The grown-up girl Virgo will not harass the fan with whims, demanding to get her a star from the sky. The discerning girl will prefer to consider the nuances of a future marriage. Mentally draw up a plan for each year of family life. 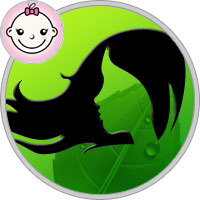 Girl-Virgo diligently performs the smallest task, parents and friends can always rely on her. Most praise sounds from the lips of teachers and educators: obedient children are a rarity. Belonging to the earthly sign clearly defines such traits of character as diligence and diligence. In any case, she tries to achieve an ideal result. Her school notebooks and textbooks are always arranged in strict order, the clothes are laid out in their places. The young girl, Virgo, shows high professional qualities. It will be scrupulous to recheck every detail of the report until late at night, but the chief will remain satisfied with the perfectly executed work. The Virgo girl is so confident in herself that she does not need outside approval. She always knows what she wants, tries not to bow out of her goal. The girl does not show exaggerated claims to the surrounding people, does not seek a luxurious life. In everyday life she is satisfied with the simplest, but high-quality things. An amazingly modest girl does not like to be praised. Helping people, high professionalism is the norm, not an object of pride. She just does the necessary things without attracting attention. The obedient, modest girl is not as simple as it seems. She tries to behave politely and tactfully, does not like arrogant and unceremonious people. The Virgo girl respects the personal space and choice of each person. She believes that she deserves a reciprocal courteous attitude, will not tolerate insults, even from close people. May harbor grievances, certainly express her claims, even after a few years from the day of the unpleasant incident. The Virgo woman will not forgive betrayal and betrayal, prefer to part with the chosen one. If she keeps the conjugal union, she will constantly remind the unfaithful partner of her unworthy behavior. The Virgo girl is distinguished by curiosity and observation. She has to figure it out herself, so she studies the world with great curiosity. It differs restraint and punctuality, performs all the necessary actions in time: lifting, playing, studying, sleeping. Has an excellent appetite, always eats with pleasure. She loves to spend time with her peers, but she will not be upset if she does not have anyone to play with at the moment. In school years, the girl-Virgo impresses with her ability to succeed everywhere, and in all cases she is laid out completely, trying to achieve an ideal result. She studies well in all subjects, participates in amateur and sports competitions. Teachers can not boast of a talented student, she is constantly set as an example for classmates. At some point, she may become conceited and start behaving arrogantly, her parents will have to hold an educational conversation with her. The Virgo girl has sufficient reasoning not to do stupid things in adolescence. She already builds clear plans for a future life, so she spends a lot of time writing textbooks or studying with tutors. During this period, parents should monitor the nutrition of their daughter. She can get carried away with the newfangled methods of losing weight, as she strives for excellence in everything. Virgo girl is confident in her abilities. She is not inclined to violent suffering for any trifles. Excessive demands of parents — the only reason that can cause irritation girls. Do not annoy the girl with advice on any occasion. She is reasonable enough to manage herself. It is necessary to help the girl-Virgo only in case she herself asks for help.